Author: Constance Kutsch Lojenga. Series edited by: M. Lionel Bender †, Franz Rottland †. 14 pp. Roman, 517 pp. 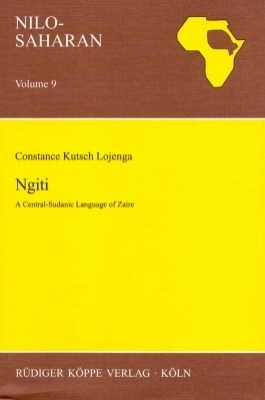 Ngiti (also called Southern Lendu) belongs to the Lendu subgroup of Central Sudanic, which in turn is a branch of the Chari-Nile subdivision within the Nilo-Saharan language family. It is spoken by about 100,000 people (1991) in the Ituri Province / northeastern region of the Democratic Republic of the Congo. The first chapter focusses on the classification of Lendu and Ngiti, showing that Ngiti diverges from the Lendu dialects. Chapters 2-4 treat the phonological structure of Ngiti. A special feature of the language is the contrast between voiced and voiceless implosives, only found in Lendu and Ngiti. Chapters 5-9 deal with the different word classes found in Ngiti and their syntactic behaviour. The language makes a distinction between alienable and inalienable possession as well as verbal plurality. [...] ist die Beschreibung in ihrem Aufbau und ihrer Lesbarkeit durchaus vorbildlich. Die gute Lesbarkeit wird vor allem dadurch erreicht, daß Sachverhalte häufig dreifach vorgestellt werden, einmal in Worten, dann durch Beispiele und schließlich in Formeln, Tabellen oder Schemata.